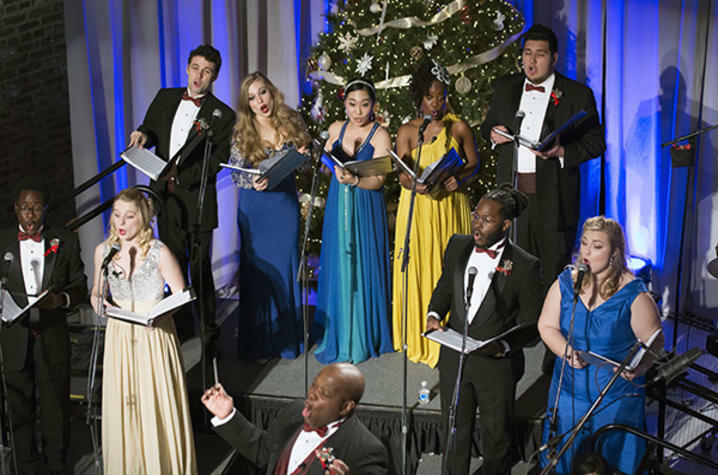 UK Opera Theatre students perform "I Heard the Bells on Christmas Day." LEXINGTON, Ky. (Dec. 6, 2018) — University of Kentucky Opera Theatre in coordination with Alltech presents the 13th annual "Celebration of Song." Spend the afternoon with the Central Kentucky community as it gets in the holiday spirit with everyone's favorite sing-along carols in concert Dec. 9, at The Square. These concerts are free and open to the public. Conducted by UK Opera Theatre Director Everett McCorvey, "Celebration of Song" will feature beloved holiday music by award-winning vocalists from UK Opera Theatre. Among the featured vocalists will be winners of the Alltech Vocal Scholarship Competition, as well as special guest performances by renowned musical artists. The concert was the brainchild of Alltech founder Pearse Lyons, and his wife Deirdre, who continually demonstrated their passion and dedication to Lexington's local arts scene through the years. It also celebrates the long-lasting partnership between Alltech and the UK Opera Theatre program. Due to popular demand, the "Celebration of Song" concerts will be performed twice at 3 p.m. and 5:30 p.m. Sunday, Dec. 9, at The Square, located at the corner of West Main Street in downtown Lexington. For more information on "Celebration of Song," visit www.celebrationsofsong.org or contact UK Opera Theatre at 859-257-9331. Spend the afternoon with the Central Kentucky community as it gets in the holiday spirit with everyone's favorite sing-along carols at "Celebration of Song," Dec. 9, at The Square.